Kenya’s population is estimated to be at least 51 million. The majority of the population is made up of the youth, accounting for more than 60 percent. There are no official records about the unemployment rate in Kenya. Some sources quote it at 39.1 percent, the highest in the East African region. 90 percent of the unemployed are the youth, despite majority of them having the required education. Kenya’s education system has largely been blamed for the increased unemployment rate among Kenyans, especially the youth. The education system has been blamed for being more theoretical than equipping learners with the much-needed practical skills. The increased unemployment rate has not stopped learning institutions from producing graduates who join the job-seeking world every year. More than 30,000 young people graduate annually with minimum or no jobs at all to take up to. A majority of young people have opted to join the Small Medium Enterprise (SME). The SME sector is among the biggest employers in the country. The sector employs 86 percent of Kenyans and contributes at least 45.6 percent to the country’s gross domestic product (GDP). The SME sector seem to be ailing though. The field is becoming saturated and the hard business environment just made things worse. Stats show that more than 400,000 SMEs are closing down their businesses every year. With the introduction of numerous taxes, including the presumptive one, more SMEs will surely be exiting the market. What most Kenyans youth need at the moment are practical skills. Skills that can make them stand on their own, innovate and invent ways to make not only their lives better, but those of their families too. The truth is, most of these young people carry the hopes of their families. In fact, the main reason why the majority of them go to school, is that after graduation, they get a job and come back to help their families. What can be done to equip young people with practical skills? Members of Permanent Working Group on TVET in Kenya (PWG) in cooperation with the Technical and Vocational Education and Training Authority (TVETA), under the patronage of the State Department of Vocational Training in the Ministry of Education, are hosting the second edition of Hands On The Future Kenya Skills Show. 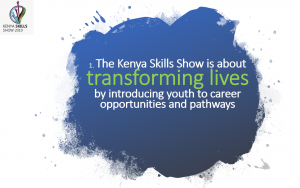 During the show, both young and old will have an opportunity to learn, experience and have a feel of the first hand interactive and informative showcases on training, entrepreneurship and life skills. Entrepreneurship skills are work most Kenyan people need. If the right innovative and entrepreneurship skills can be implemented in our young people, then Kenya will be on the right projectile, to the right direction. 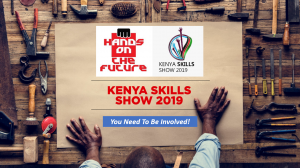 The event will be taking place starting tomorrow 8th to 10th of February 2019 at the Kenyatta International Conference Centre (KICC). Njoo ujijenge na skills na upate maarifa ya kujiendeleza.